A light and fluffy chocolate cake filled with a tangy whipped cream filling and juicy black cherries, topped with more whipped cream and chocolate sprinkles. It’s a quick and easy version of the traditional Black Forest Cake. I have made this cake so many times over the years for birthdays and holiday get-together. 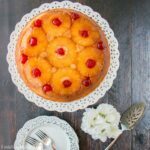 It’s my go-to cake recipe when I am short on time, but need a delicious dessert that is sure to impress. What I love about this recipe is that it is so easy to make. Basically, all you need is one chocolate cake mix, one can of pitted cherries, one package of cream cheese, and one carton of whipping cream, so just 4 basic grocery items. You simply bake the cake as instructed, make the whipped cream filling, open the can of cherries, and assemble. It doesn’t get any easier than that. 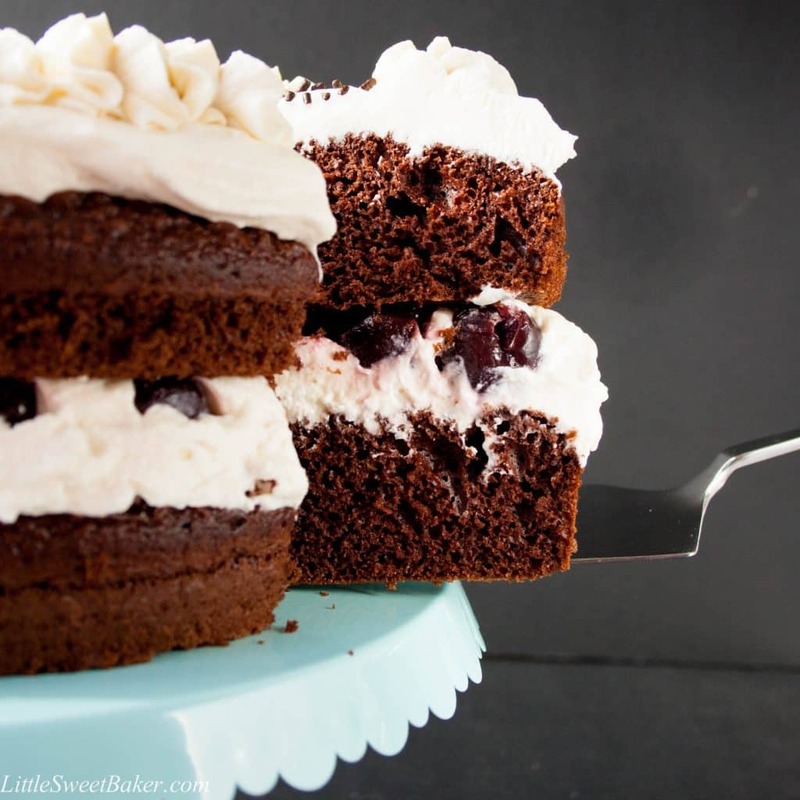 The result is a moist chocolatey cake with a rich, creamy filling and juicy black cherries. 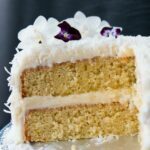 For this recipe, I used a whipped cream and cream cheese filling. I like the tangy flavor the cream cheese adds to the whipped cream; it makes it sturdier too. But if you prefer, you could also use just a simple whipped cream. A light and fluffy chocolate cake filled with a tangy whipped cream filling and juicy black cherries, topped with more whipped cream and chocolate sprinkles. Bake cake as instructed for two 8 inch or 9 inch rounds. Let cool completely. Spread about one quarter of the whipped cream on one of the cakes. Spoon the cherries on top and spread another quarter of the whipped cream on top of the cherries. Layer the second cake on and top with the remaining whipped cream. Decorate with chocolate sprinkle or curls if desired. You’re very welcome, Dave! I’m happy your wife was impressed and thank you for your kind words. Enjoy! I would like to make this cake the day before serving. Can i store it in the fridge filled or should i fill on the day. Yes, you can make and assemble this cake the day before and store in the fridge. Let me know if you have any other questions. Enjoy! I baked this cake for my daughter’s birthday recently and all of her friends continued asking for more until the cake disappeared! This looks amazing. Black Forest cake is one of my favourite cakes..I can’t wait to make it. I love your recipes Lily. What a beautiful cake! Merry Christmas! Thanks Nancy and Merry Christmas to you too! 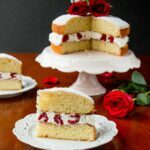 Black Forest Cake is one of my favourites and I have never ever attempted to make it because it seems so complicated But even I think I could try your recipe. Chocolate, cherries and cream are a match made in heaven! Thanks for sharing this… I will definitely be trying it in the new year! Black Forest is one of my all time favourite cakes! And I love how easy this one is, yumm! I love the addition of cream cheese in the filling, Lily! What a relief to see that you, Baker Extraordinare, will go with the ease of a boxed mx. 🙂 However, you’re piping skills still leave me envious! Beautiful and delicious cake! Hi Lily – I love Black Forest Gateau so this really appeals to me! My little one is now 17 so I wouldn’t be holding back on the kirsch! Happy Holidays Lily!